Hello there! I’m popping in to share my new aquisition: a Burley Travoy trailer for hauling groceries. Since Mr. Dottie and I sold our car six years ago, we have been doing most of our grocery shopping on foot, walking to the nearby shop once or twice a week. (You can read about our car-free shopping strategies here.) 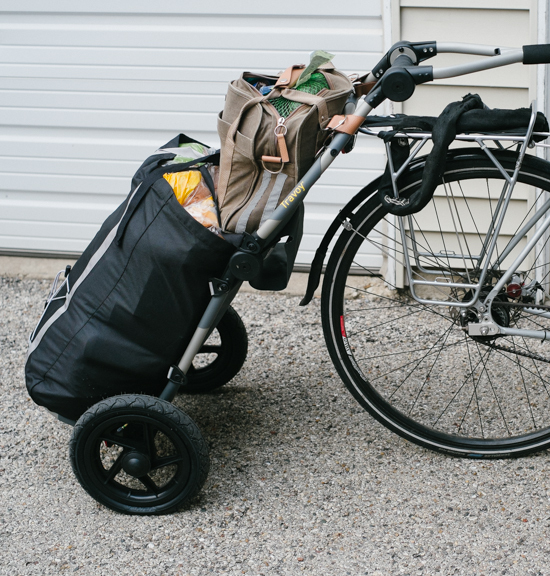 This fall, in an effort to slash our grocery budget, we decided to invest in a Costco membership and a bike trailer to allow us to haul home a month’s worth of bulk purchases. We’ve been using the trailer for a couple of months and it’s working out very well (our food spending is way down). Mr. Dottie steers the ship because I need to buy an attachment thingie (technical term) in order to fit the trailer on my bike. I pull my weight by bringing home the eggs, safely nestled in my basket. If I had unlimited money and parking space, I would still prefer a bakfiets for shopping! But this trailer is a reasonable compromise. I paid $250 for the Travoy and have already made up for the price in lower food costs. 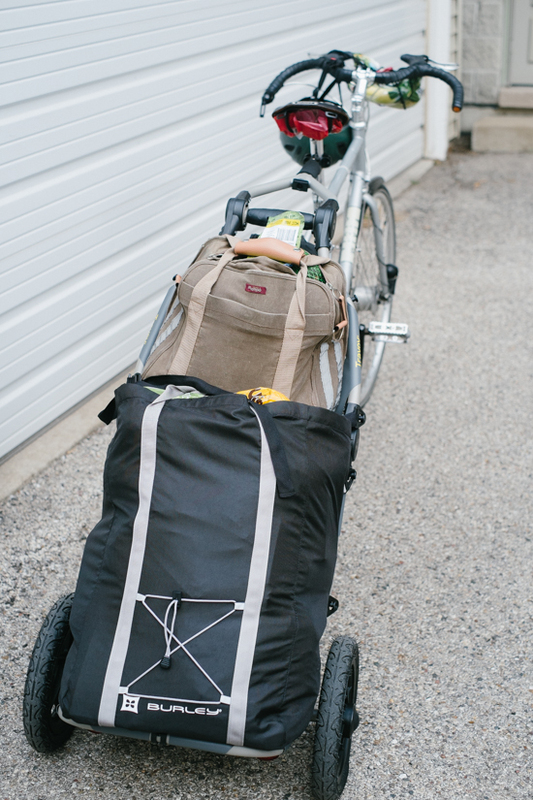 I promise to write a full and detailed review of the Burley Travoy at some point in the near-ish future. Until then, I wish you all Happy Holidays!! P.S. I have done basic grocery shopping and even bulk shopping (a few times) by bike, but the trailer makes the operation much easier. One of the best things about the Internet is when it lets you keep up with old friends, especially when it means discovering you have a common interest. Last week a high school friend of mine, who now lives in Missoula, Montana, blogged about how she and her partner, “the Handyman,” had started a business: building bicycle trailers! Daisy pulls the "skinny legs" trailer. It’s a fancy science theory that explains why ants and bees and even beer yeast are helpful and nice to each other; even if they’re not related. We think that’s kind of cool. And we want to contribute to all that helpful kindness that goes on among bikers. That’s why we’ve started GreenBeard Trailers. 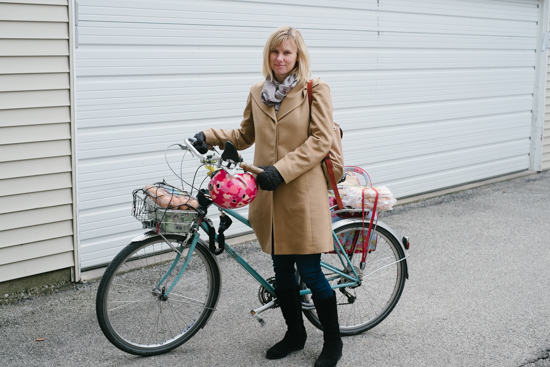 Because we think that there’d be even more people out on their bicycles if they had enough room to cart groceries or construction supplies or library books or whatever you need to carry that can’t fit in that spiffy basket you have on your handlebars. Love it! It’s always fun to see independent businesses like this popping up, and even better when one belongs to someone you know. Now if I decide I need a trailer, I know where to go. Has anyone tried out a trailer?